Utah’s six, frontier, coalbed gas plays (hatchured and numbered) in relation to the state’s coal fields (shaded). The remarkably successful development of gas deposits in coalbeds of the Ferron Sandstone Member of the Mancos Shale in central Utah’s Emery coalfield has encouraged petroleum companies to look for new coalbedgas “plays” elsewhere in the state. 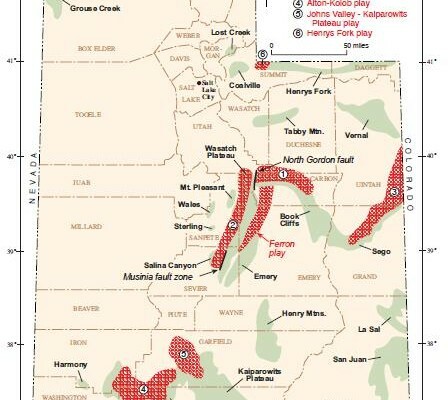 There are currently six frontier coalbed-gas plays in Utah attracting industry interest: (1) Book Cliffs, (2) Wasatch Plateau, (3) Sego, (4) Alton- Kolob, (5) Johns Valley-Kaiparowits Plateau, and (6) Henrys Fork. These six frontier coalbed gas plays are in various stages of testing or development. The undeveloped portions of these six plays collectively contain an estimated in-place gas resource ranging from 2.0 to 9.8 Tcf, which is significant compared to Utah’s 2001 proven gas resource of 4.6 Tcf. Book Cliffs Play – The best-defined frontier coalbed-gas play consists of the thick, gassy coals of the Blackhawk Formation in the Book Cliffs coalfield. Exploration began in the early 1970s, and a modest amount of coalbed-gas production took place during the 1990s. This play may be poised for full-scale development if current efforts can overcome the production problems that plagued the earlier efforts. Although extensively mined, the Book Cliffs play contains about 70,000 acres underlain by deeper coal in the Blackhawk Formation where the aggregate coal thickness ranges from 10 to 70 feet, and drilling depths range from 1,500 to 6,000 feet. The coal’s gas content ranges from 60 to 435 cubic feet per ton, and thus provides a range of 0.8 to 1.9 trillion cubic feet (Tcf) of in-place gas resource. A joint venture of the J.M. Huber and Patina Oil and Gas corporations is redeveloping the previously abandoned Castlegate field; reported proven gas reserves for the 17 producing wells are over 27 billion cubic feet. A little to the east, J-W Operating Company drilled six wells in late 2002 to test the Blackhawk coals there. Wasatch Plateau Play – Coalbeds in the Emery Sandstone Member of the Mancos Shale occur under the Wasatch Plateau of central Utah, and are not exposed at the surface. Extrapolating from a handful of oil and gas wells indicates these nevermined coals underlie about 180,000 acres of the Wasatch Plateau. At least 17 coalbeds with a collective thickness of up to 120 feet occur within the 1,600-foot-thick Emery strata. No published gas-content measurements exist for these coals, but one company reports some beds are gassier than others. The in-place gas resource for this play is estimated to range from 0.8 to 3.2 Tcf. Prima Energy Corporation is drilling on its 71,000 net acres of leases, and several other petroleum companies have drilled wells in this play recently. Sego Play – The Neslen Formation coalbeds of the Sego coalfield are exposed along the Book Cliffs in Grand County. These coalbeds extend northward into the Uinta Basin along the Colorado-Utah state line, and underlie roughly 240,000 acres. The Neslen Formation is up to 700 feet thick, and contains an average of 14 feet of coal in one to seven beds. While shallow core samples contained less than 49 cubic feet of gas per ton of coal, there are indications the deeper coals are gassier. CDX Rockies, LLC recently tested gas contents from deeper coalbeds in the Uintah County portion of the play, but released no results. We estimate in-place gas resources range from 0.3 to 1.8 Tcf. Alton-Kolob Play – In southern Utah, the Dakota Sandstone’s coalbeds are best developed in the Alton-Kolob coalfields. The Dakota Sandstone is up to 450 feet thick and contains two coal zones. These two coal zones collectively contain up to 18 feet of coal, and have an average aggregate thickness of 13 feet. While the two reported measurements from shallow samples revealed low gas contents of 0 and 14 cubic feet per ton, this 400,000- acre play could contain nearly 1 Tcf of gas if the deeper coalbeds contain an average of 100 cubic feet per ton. Several companies have leased more than 34,000 acres in the play. Legend Energy of Utah is the most active company, and has staked 23 drill-hole locations; drilling began at two locations in November 2002. Johns Valley-Kaiparowits Plateau Play – The thick Straight Cliffs Formation coals have attracted some interest in the Johns Valley area and the northern part of the Kaiparowits Plateau coalfield in Garfield County, outside the Grand Staircase Escalante National Monument. The 130,000-acre play contains an average aggregate thickness of 40 feet of coal within the 600- to 1,600-foot-thick John Henry Member of the Straight Cliffs Formation. A group of investors with large private holdings in the Johns Valley portion of the play is undertaking an evaluation of the coalbed gas potential on their lands. While 13 shallow samples near the outcrop had low gas contents, they hope the deeper coalbeds contain at least 100 cubic feet of gas per ton. If so, this play could contain 0.9 Tcf of gas. Henrys Fork Play – This dual play lies in eastern Summit County, and consists of thick coals in both the Frontier and Adaville Formations. The coals are exposed in Wyoming, but in Utah they are poorly exposed or buried by younger rocks. These two coalbed gas plays occur as parallel, northtrending belts that cover a combined area of roughly 50,000 acres. 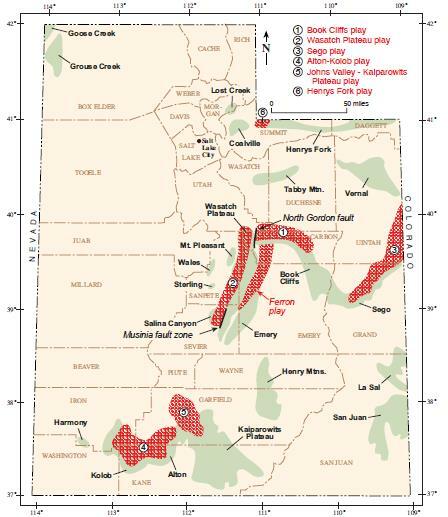 Data from two Utah wells indicate that the Adaville has an aggregate coal thickness of 100 feet, while the Frontier contains an aggregate coal thickness of 50 feet. Two companies have recently tested the gas content of these coals in Wyoming, but again no results have been released. Lacking gas-content data for these coals, we estimate the in-place coalbed gas resource for both formations could range from 0.1 to 1.0 Tcf.